It happens to the best of us. Yes even the food-obsessed like myself sometimes run into a rut with our cooking. So how do I dig myself out of the boredom ditch? Usually picking up a favourite (or new) cookbook is enough but sometimes I like to set a little challenge for myself. Here are two of my current go-to anti-boredom ‘games’. Using different spices is by far the quickest and easiest way to make a boring old dish taste new and exciting. They don’t take up much space and last for ages in your pantry. Dried Chilli (flakes or powder) – probably the most versatile but there are plenty of other options which I’m finding myself veering towards now I have sensitive little mouths to feed. Sumac – a Middle eastern spice that is brightly coloured red. It adds beauty and a lemony fresh flavour. Use it anywhere you’d normally think to add a squeeze of lemon. You’ll probably need to order online or go to a specialist spice store – but it’s totally worth the effort of tracking down. Smoked Paprika – from Spain does exactly what it says on the label – adds a complex smoky flavour. Brilliant with anything tomato based, red meat and pork. Garam Masala – my ‘go-to’ Indian spice if I’m in the mood for a bit of curry. I tend to reach for garam masala over a generic curry powder. See here for substitutions. Ras el Hanout – a Moroccan spice blend with an exotic flavour. Works really well with fish and chicken and vegetables like eggplant (aubergine). See here for substitutions. Baharat – a Lebanese blend of 7 spices including paprika, pepper, cumin, cinnamon, cloves, cardamom and nutmeg. It’s a bit darker and more intense than Ras el Hanout but still works well with meat, poultry, seafood and vegetables. See here for substitutions. Shicimi Togarashi – a spicy Japanese spice blend usually used as a sprinkle to season food instead of salt and pepper. I love it on avocado or eggs or in these spiced cashews. For more ideas see here. Fennel Seeds – great with fish or pork or to add a boost of fennel flavour to fennel dishes like this one. One of the things I love most about our little house in the country is my herb garden just outside my kitchen door. Ever since reading ‘Under the Tuscan Sun’, I’ve dreamed of this little luxury. While I’ve always cooked with fresh herbs, I’ve been using them even more now I have a free supply. Flat Leaf Parsley – on everything and anywhere you want some fresh greenness. Literally everywhere. In salads. If you’re not sure add parsley. Rosemary – beef, lamb, potatoes. Tarragon – with eggs (I stir it into mayo) or chicken. Works well with orange. Mint – in salads, with lamb, Middle Eastern dishes, Vietnamese. Coriander (cilantro) – with chicken, Mexican dishes, Asian dishes. Basil – tomatoes, eggplant, in salads, on pizza, Italian dishes, Thai dishes. Sorrel – in salads (finely chopped if leaves are large), with fish. Want a simple way to enjoy your time in the kitchen in 2019? If you’re interested in learning how to simplify not just your cooking, but the whole of your life, then I recommend checking out A Simple Year. It’s a 12 month program which focuses on simplifying a different area of your life each month. If you join us I’ll show you even more ways to simplify not only recipes but your kitchen and your approach to healthy eating. NOTE: The ‘early bird’ discount (Save $100) ends November 14th. OMG, I can’t tell you how much I’m in love with the Turkish idea of combining yoghurt and melted butter as a sauce. It’s soo soo good. You get all the tangy creaminess of the yoghurt and then the nutty richness of the caramelised butter. 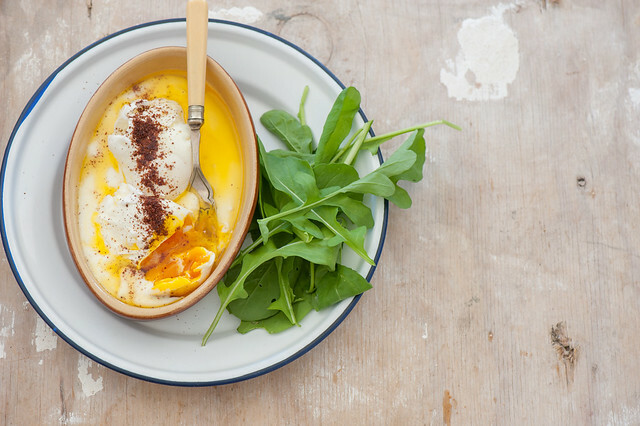 It’s brilliant here for your breakfast eggs but it’s also genius with vegetables. One of my faves is to add it to charred eggplant. Also great with grilled chicken or fish. If you’re nervous about poaching eggs, I used to be as well. Just use lots of vinegar and the freshest eggs you can get. 1. Bring a medium pot of water to the boil. Add vinegar and bring back to a rapid simmer. 2. Crack eggs into the water. Simmer gently for 3 minutes (longer for well done). Remove eggs with a slotted spoon and pat dry on paper towel. 3. Meanwhile, divide yoghurt between two plates or shallow bowls. 4. When eggs are cooked, pop 2 eggs on each plate on top of the yoghurt. Drizzle with chilli oil or melted butter. Sprinkle with sumac (if using) and serve with salad leaves on the side. *melted butter – if using melted butter I like to slightly caramelize it to add extra nutty brown flavours (although straight melted butter is good too). Just melt butter in a small saucepan and let it sizzle on a medium high heat for a minute or until it looks brown and lovely but not burnt. dairy-free – use chilli oil and replace yoghurt with hummus. 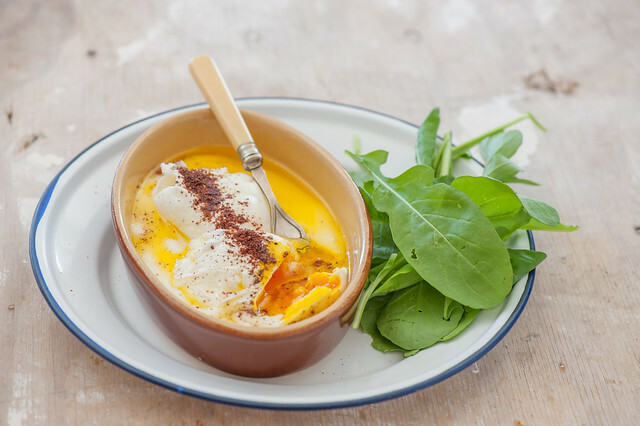 different eggs – I adore poached but fried, boiled and peeled or scrambled would also work. carb-lovers / more substantial – serve with warm flat bread or hot buttered toast for dipping. crunchy – add some toasted nuts like almonds or pine nuts. different vinegar – you just want something to make the cooking water nice and acidic to help the whites solidify as soon as they hit the cooking water. I use cheap white vinegar for this but you could use any vinegar you have – although it’s a bit of a waste of your fancy vinegars. ps. This is the 6th and final year we’ll be running ‘A Simple Year’. It’s something I’m really proud to be a part of not only sharing my expertise but also learning from the other contributors. I love how there’s a different focus each month to keep me on track without feeling overwhelmed. NOTE: The ‘early bird’ discount (Save $100) ends November 14th 2018. I really like your tips! I also enjoy cooking and yes I must admit the there are times I ran out of ideas to make. I always search for new recipes on the web especially the healthy and easy ones an I didn’t know that even simple spice addition can help tweak the meals I am cooking! Good thing I was able to read your post. It really gave me more ideas on what to do next to constantly improving on my hobby. Glad you found them helpful Will! This was an awesome post. As a new food blogger myself, I am little anxious and nervous that I lose “inspiration” and run out of recipes and topics to blog about. But this post gives me some confidence that their always ways to spice things up and keep things interesting. Glad you enjoyed Kevin… I’ve been blogging for 11 years now and still have plenty of recipes and topics… Don’t worry you won’t run out. Good post. I bung chopped coriander in almost everything, it lifts the dish. Yay for coriander Mary! I have masses of basil in my garden at the moment so it’s become my go-to herb! great reminder for some of these and great introduction, for me at least, on a lot of your spices, thank you for this list!